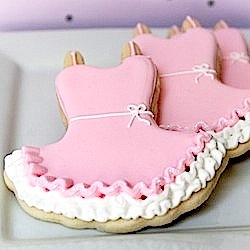 Here they are......My ballerina tu tu cookies. This is my first attempt at making ruffles. 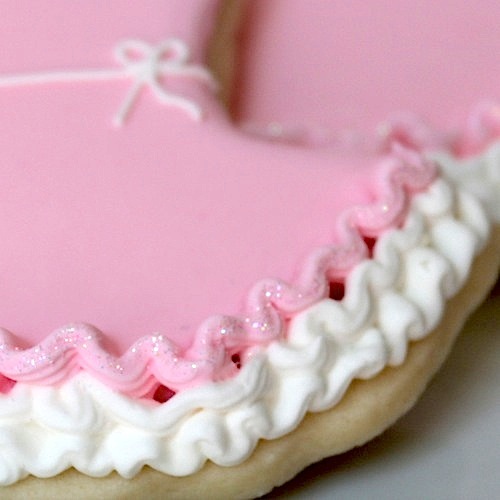 Aren't these the cutest little girlie cookies? Pink, ruffles and glitter.....what could be better? When my two oldest daughters were little I made all of their Halloween costumes. One year I made them ballerina costumes. They were so excited. We even set up a little photo shoot. It was fun and just something we always did......we played a lot. This is one of my favorite pictures of them in these costumes. This picture was taken during a time when they just loved each other so much, and NEVER got into a fight. Now it's she did this and she did that....typical teenager stuff. They share a room, which I am sure doesn't help. It reminded me so much of my four daughters, who all have a love of dancing....and just being girls. I've been wanting to try making ruffles on a cookie for a while. This was the perfect opportunity. It is my first attempt and certainly not perfected yet, but I will continue to practice until it's just the way I want it.....I'm a bit OCD. OMG I love these cookies Giselle!! How beautiful! Your blog, and your incredible cookie-designing talent, makes me smile every morning! Adorable! These look so much better than the one on Copper Gifts. Thanks for all the wonderful compliments. I love baking and creating works of art with my food. Yes it was my first time making ruffles. These are just too adorable! Cutest cookies I've seen in a long time. You have a really lovely blog.